Brandeberry Winery sits adjacent to the home of Jim Brandeberry on Jackson Road in Enon. The winery and tasting room were built in 2008…just in time for a natural disaster. Not long after, the Brandeberrys rescued a stray cat, who they named after the hurricane. The feline Ike spent a couple of years as “official greeter” at the winery until he was, sadly, hit by a car. They dropped the “Windy” from the name. The crisp, lemony wine is still called “Ike” and bears a picture of the critter on the label. While Brandeberry’s intellectual pursuits now tend towards the oenological, ‘twas not always thus. Brandeberry moved to Dayton in 1969 to take a position at the Wright State in computer science. (As I’m a former tech geek, we spent a nice chunk of time reminiscing about the joys of FORTRAN programming. He honed his early punch card programming chops on an IBM 650 “drum computer” at the University of Toledo.) In the 1985-86 school year, WSU established the stand-alone College of Engineering. Brandeberry served as Dean for 19 years until his retirement in 2005. In the early 90’s, Brandeberry and his wife, Sharon, were driving to visit family in New York City. They’d stopped on the way in the Finger Lakes region. Jim said that he “saw a sign for the Cayuga Wine Trail” and they spontaneously decided to winery hop for awhile. In one of the winery gift shops, Jim spied a “Winemaking for Beginners” book. “It was only a buck!” exclaimed Jim. The winemaking bug bit hard. Jim (the “Li’l Olde Winemaker,” according to his nametag) had been making cider from the apple trees on his property for years, so he started with fruit wines. After the apple came peace, pear, and strawberry wines. The jump was short from fruit to grapes. “I started by buying juice from Valley Vineyards (in Morrow) to make five gallons of wine at a time. After his two horse-riding daughters grew up and moved out, Jim converted his pasture into his first vineyard. On the “estate,” Jim currently grows Seyval, Vidal, and Cayuga – all white varietals. He says that he’s still searching for the right red grapes to grow on the property. 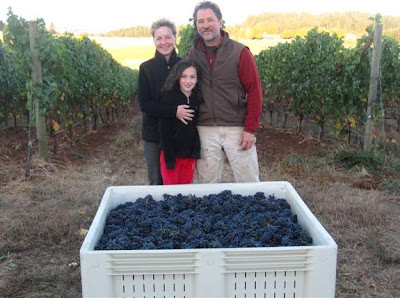 He grows a small amount of a red varietal called Noiret (no-RAY), although it’s “sufficiently different from what people are used to that it’s not a big seller for me,” said Jim. "The Li'l Olde Winemaker" at work. His tour of the setup was educational and informational. I’ve suffered through a number of bad winery tours. Jim’s clear pleasure while sharing a simple story about why his crusher/destemmer (which he calls his “Lucille Ball Machine”) that morphed into a history lesson about the practice of grape stomping was a refreshing change. At his “mad scientist station” where Jim adjusts the composition of his various creations, Jim asked for my opinion on his upcoming pinot grigio release, which I thought was greatly improved with the addition of a small amount of the traminette grape. Kelly Brandeberry in the tasting room. While not my usual proverbial cup of tea, I thought Brandeberry’s sweet wines were actually drinkable. Many local wineries’ “sweet” offerings are cloyingly thick, syrupy messes closer to Kool-Aid than wine. Jim took a more evenhanded approach to these wines. They’re still sweet, but they’re not heavy. 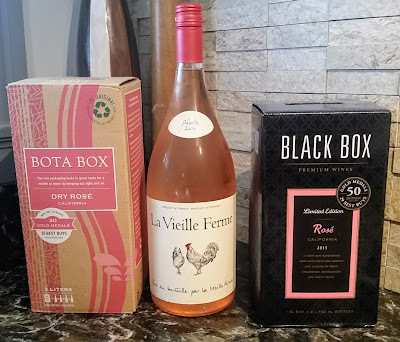 Even their sweetest wines, the Cayuga/cherry blend called “Pink Passion” (Kelly’s favorite) and the top-selling blackberry, have some balance, structure, and flavors beyond sucrose. 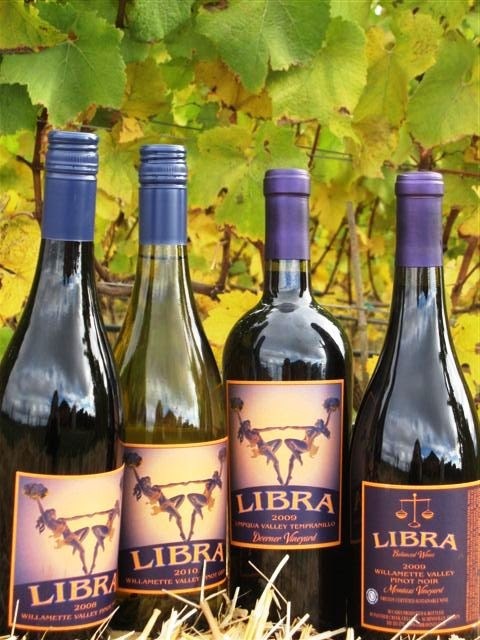 Brandeberry Winery hosts live music every Saturday. Cookouts are regular weekend occurrences in the summer and fall. Wine is available for visitors both by the taste and by the glass. Light appetizers are also available for purchase, as is the official “Berry Monster” artwork t-shirt. The Brandeberrys also host an annual “Dogtoberfest” fundraiser for the Clark County Humane Society. This year’s Dogtoberfest master of ceremonies will be the winery’s newest official mascot, Mingo, an adorable 40-pound mutt who bid me farewell from the estate with many kisses. Kelly with Mingo, winery mascot. This story originally published in the Dayton City Paper. Not long ago, my father-in-law sent me a voucher for “$100 off a case from Naked Wines” that he’d received in one publication or other. A Benjamin off a case? A name that already makes me feel like a cousin? Sure. I’ll bite. I wondered what the catch might be – but still…what’s the worst that can happen? I plopped myself down, opened up the ol’ browser, and got to work. 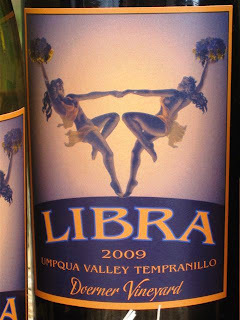 Naked Wines is an interesting online “wine club” of sorts. Rather than the typical wine club model where a customer receives a shipment every so often, paying along the way – Naked Wines works on an escrow model. The process goes something like this. If you become one of the “Naked Angels” club members, you agree to put $40/month into an account with them. You then can use this money at any point to purchase a quantity of wine via their website. According to the site, the idea is to fund independent winemakers. In return, the club member receives wholesale pricing on the wines on the site, most of which are exclusively sold through Naked Wines. Seems like a good setup, potentially. (Although if the wines are generally not available for retail purchase, there’s no retail middleman to cut out in the first place…but I digress.) The discounts can be quite steep. The most expensive wine on the site “retails” for $75, but club members get it for $30. Club members also get $1 sample bottles with each case and free tastings if you’re lucky enough to visit one of these wineries. You don’t have to become a Naked Angel to order from the site, though. You can use a voucher, as I did, or you can use a Groupon when one becomes available. You just pay the “retail” price, less whatever your voucher’s good for. William Henry 2012 California Riesling – This wine absolutely needs some air, but once it gets a few spins in the glass and a warms a tad, the nose really changes from green apples and flint to melon and honey. The nose belies the body, which actually has very little fruit to speak of other than little bit of lemon backed with a whole lot of mineral, which follows on the finish almost to the point of being metallic. It’s certainly an *interesting* wine. On its own, I don’t know if it would be for everyone. I liked it well enough. I had the rest of the bottle with a New Orleans barbecue shrimp – and it was downright tasty. ($11. Club price $6.50). There were two other bottles in the case, neither of which I really took notes on -- F. Stephen Millier Angel’s Reserve Viognier ($10, club price $6) and Ken Dies 2011 Napa Valley Cabernet Sauvignon ($40. Club price $20). Both wines were solid but unspectacular. So, what’s the bottom line? The “retail” prices of the wines are obviously set artificially high to make you think you’re getting a good deal if you become one of the “naked angels.” Once you’re at “angel prices,” some of the wines become very good deals. That said, the notion of escrowing $40 a month to get wines of similar quality that you could get in a good wine store doesn’t exactly appeal to me. I’m lucky to have several very good wine stores within a small radius of my domicile. If you live in a locality where extensive wine selections aren’t readily available and you want a steady supply of decent juice, Naked Wines might be a good option. Otherwise, you’re probably better off with your handy brick-and-mortar store with a wine salesperson you trust. You can check out Naked Wines at http://www.nakedwines.com. They currently ship to AK, AZ, CA, CO, CT, DC, FL, GA, HI, IA, ID, IL, KS, LA, MA, ME, MI, MN, MO, NE, NV, NH, NY, NJ, NM, NC, ND, OH, OR, TN, TX, VT, VA, WA, WI, WV, and WY. 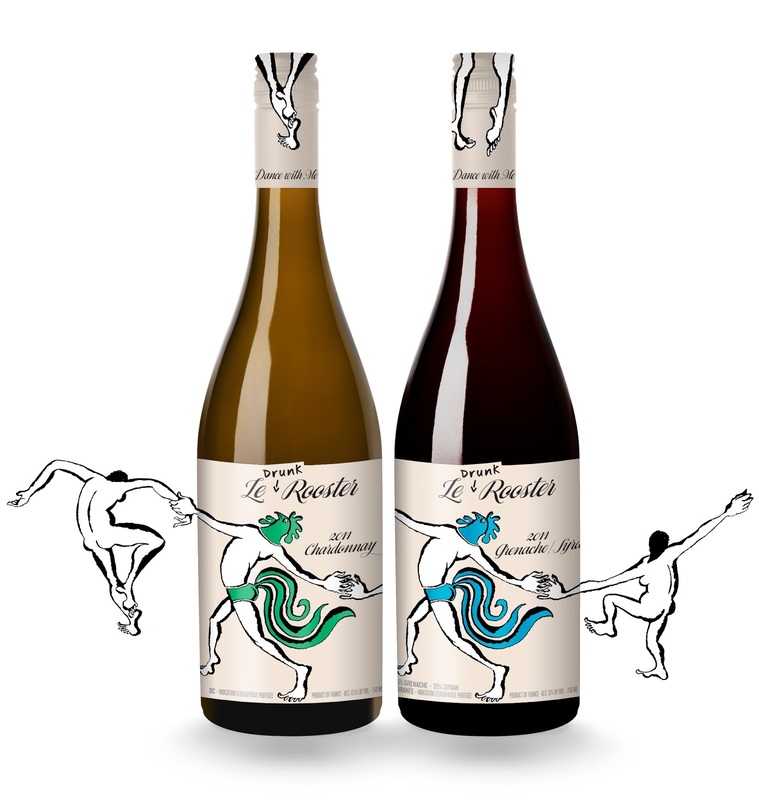 I received a couple of sample bottles from Bourgeois Family Selections of a French tipple from the Languedoc–Roussillon region called “Le Drunk Rooster.” The wine’s moniker stems from an interesting cross section of symbols. The “state bird” of France is the rooster. (The Latin word for both “France” and “rooster” is “Gallus,” interestingly enough.) 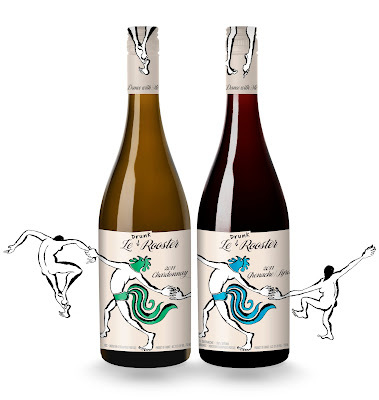 One of the winemakers that crafted these creations enjoys a good dance after imbibing. Alas, he apparently has (in a phrase I’ll steal from my mother) “more enthusiasm than rhythm on the dancefloor.” His style is, according to the information sheet, “the French version of the Chicken Dance,” hence the name. Le Drunk Rooster 2011 Chardonnay – This wine is in a light-bodied, lean style. No surprise, considering the region. After a little air opens it up, a considerable amount of oak starts to emerge. I’m not talking Meridian Chardonnay levels of oak – more like a Mersault from Burgundy (although it’s not creamy like a Mersault). It’s got a tart, green apple character on the palate with a lasting oaky finish. Even as light-bodied as it is, the backbone allows it to stand up firmly next to some pretty hearty fare. We poured this with a chicken and Italian sausage casserole, and it worked just fine. I thought it was a pretty solid food wine. Le Drunk Rooster 2011 Grenache-Syrah – We opened this one during the midst of our kitchen remodel. Our first bottle of the evening had run dry, and we needed something to sip on as the evening wore on. I knew it was from the southern Rhone, so I figured it would make a decent sluggable. Turns out it was slightly better than that. If you’re a fan of peppery wines, this one will grow on you. This blend of 65% Grenache and 35% Syrah isn’t overly heavy, it’s got a good, strong blackberry backbone, followed up by a spicy “tailfeather.” It’s pleasantly smooth, medium bodied, and even on the tannins. We didn’t have this with food – but it was reasonable with evening chocolate. Both wines retail for $10-11. Worth a try.